A multi-functional sliding gauge for easy marking. Use this handy tool for marking button holes; seam allowance gauge; hem gauge; circle compass; T gauge and that is only sewing. Try this handy tool for scrapbooking; card making; paper crafts; and much more. Adjustable from 0 to 5-inch in 1/8-inch increments. Constructed of plastic. Imported. Keep your work accurate with this versatile gauge. 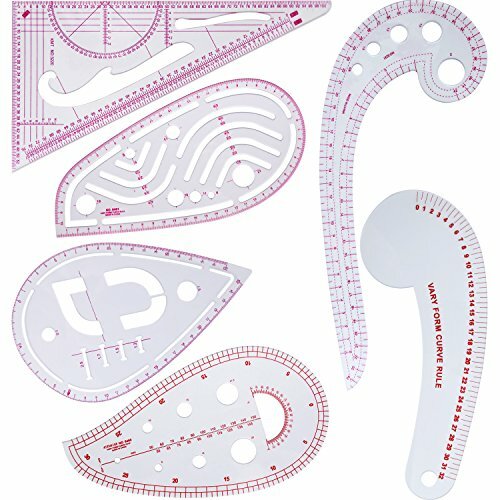 Sliding measure sets distance for marking hems, tucks, pleats and buttonholes. Fiskars large Coastal Colors Acrylic Ruler is perfectly sized for cutting strips or squares of fabric right from the bolt. It features clearly marked measurement lines and 30-, 45- and 60-degree line indicators. Made of durable acrylic. Measures multiple equal distances. Use for fast accurate spacing of buttons, buttonholes, hooks, eyes, dress pleats, drapery pleats, tucks, shirring, and smocking. Measure accurate bias or straight strips for quilting or for use with the Bias Tape Makers. Makes an ideal knitting gauge, too! Flexible and lightweight; silver finish. Expands to 24". The SimFlex Expanding Sewing Gauge gives you fast and accurate measuring. Its quick and easy to use. It has unlimited uses. It works in sewing, arts and crafts and even gardening and cake decorating! Directions: Before using, with one hand on each end, flex the gauge several times. Lay the SimFlex over your garment (or craft). Expand it to the desired length for perfectly measured, equal distances and accurate spacing. Flex the gauge so that each straight piece is the same desired distance apart at points. Check with a straight ruler and adjust if necessary. Even great for spacing seed rows & seedlings, for perfect row layouts. 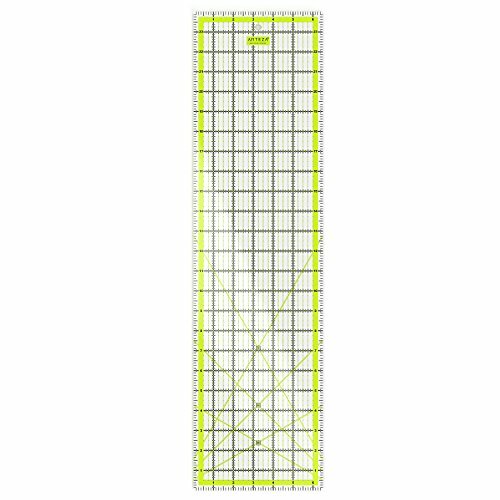 Fiskars Acrylic Ruler features a highlighted seam allowance and easy-to-read grid lines that make cutting strips of fabric from the bolt a snap. It also includes broken grid lines for easy visibility of fabric edges, 30-, 45- and 60-degree line indicators and optional non-slip vinyl feet. 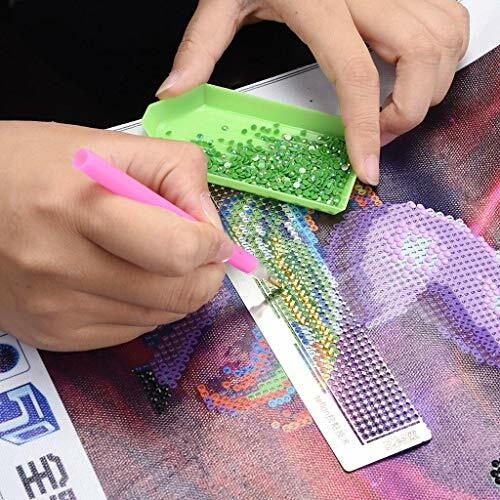 Made of 3 mm-thick acrylic for lasting durability. Sewing Hems is not an easy task as there are many complicated and error-prone steps like measuring, marking, jabbing and pinning. Ottemax 3'' measurement hemming clips are the best stress-free solution for your hems sewing project. Made of stainless steel material with precise measurement measures hems professionally up to 3 inches wide without any crook. Way better than pinning stuff, have great flexibility to glide onto fabric when sewing. Just like opening like a bobby pin, simply glide over the folded fabric, holds them tightly in place when you sew. Keep your fabric intact in neat. Ideal for hemming clothing, curtains, skirt, pants or shorts and more. Suitable for machine work and hand sewing. Material: High quality Stainless Steel - Smooth polishing, anti-rust, anti-corrosion, waterproof, oil-proof. Measurement: Total Length: 4inch (11.5cm). Measures hems professionally up to 3 inches wide without any crook. No more broken needles! Light enough to be flexible and tough, way better than pinning stuff for general purpose sewing, Springs are smooth on fingers for frequent use. 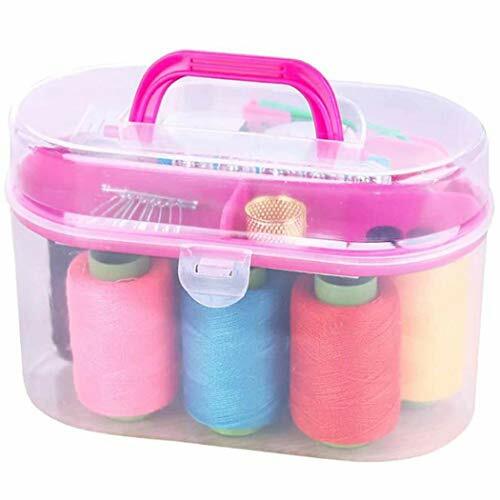 Great Replacement for Traditional Jabbing Sewing Pin, ideal for hemming clothing, curtains skirt, pants or shorts and more, opens like a bobby pin, simply slide clip over your folded fabric,holds them tightly in place when you sew, suitable for machine work and hand sewing. Warranty: 100% money back, if our items do not meet your expectations, you can always contact us at any time. Why overpay for quilting rulers that won't give you clean, precise cuts? 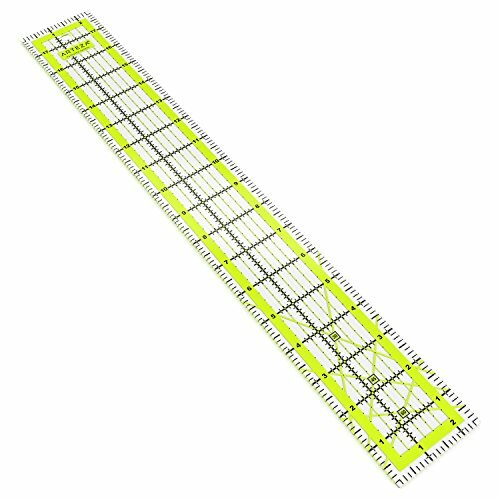 With this affordable Arteza Quilters' Ruler, you can measure from any angle & get an accurate cut every time. Quickly, easily, comfortably. If you have any problems with your Arteza Acrylic Quilters Ruler, just drop us a line & we'll gladly replace it for free. You don't even need to send it back. Perfect birthday & holiday gift. Easily Cut Any Color Fabric: Working with light & dark fabrics? 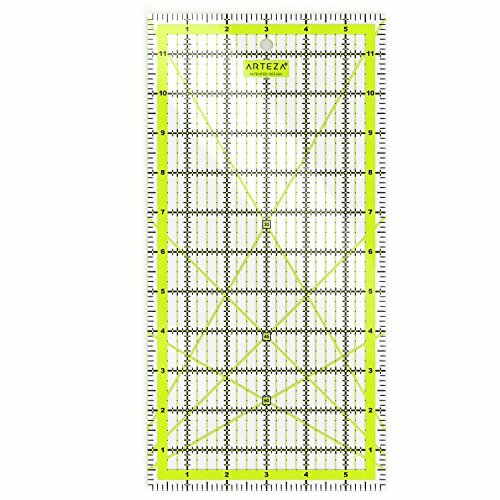 Your Arteza Quilter Ruler features patented 2-color grid lines - black & lime green - so you can always see exactly what you're doing. Better Quality on a Budget: Forget flimsy quilting rulers. This affordable patchwork quilt ruler comes in sturdy 0.1-thick acrylic, laser-cut for a cleaner edge that allows deeper, easier cutting. 1/2 Seam Allowance: Need extra room for seams? No worries. Your Arteza quilter's ruler gives you leeway on left & right sides, so you'll always get that perfect, precision cut you're after. Ideal for Right- & Left-Handed Quilters: Diagonal lines mirror each other, so you can cut from any angle, with either your right or left hand. Inch marks on all sides make measuring even easier. These drawing templates are designed with clear, so you can see the scale more clearly, and these rulers have many functions, easy for you to use. 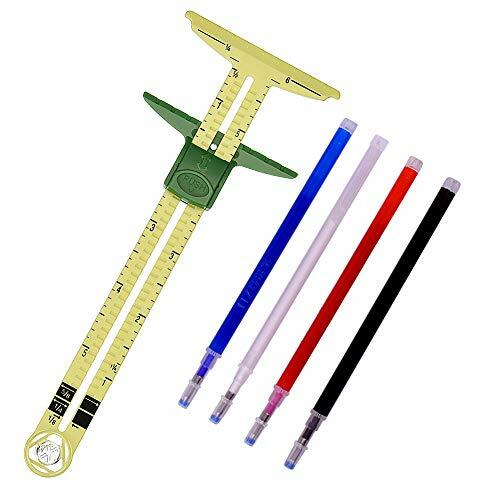 There are 6 different styles, such as triangular ruler, half round ruler, multi-function ruler, comma ruler and so on, different shapes can meet your multiple needs. 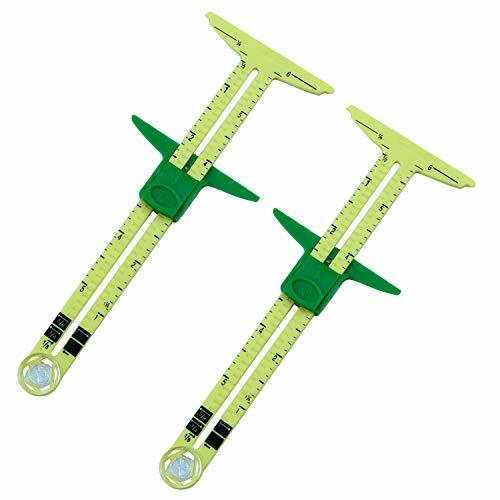 Widely applied for drawing, cutting and other clothing design, fit for designers, pattern maker and tailor, you can choose the metric ruler set to diy projecting. Measures hems professionally up to 3 inches wide without any crook. Handy holding construction achieves every easy and smoothing sewing steps. Definitely a time safer. Instead of the traditional jabbing sewing pin, these hemming clips have great flexibility to glide onto fabric and holds them tightly in place when you sew. Keep your fabric intact without any breaking. High quality stainless steel material. Smooth polishing, anti-rust, anti-corrosion, waterproof, oil-proof. This OLFA ruler simplifies any project. Its glare-free finish, perfect for use under bright work light, makes reading measurements easier. The black numbers on the ruler's frosted surface are easy to read, whether you're working with light or dark materials. You'll appreciate the accurate grid lines, in 1/8", 1/4", 1/2" and 1" increments. A compass is included, with angles for 15- 30-, 45-, 60- and 90-degree cuts. 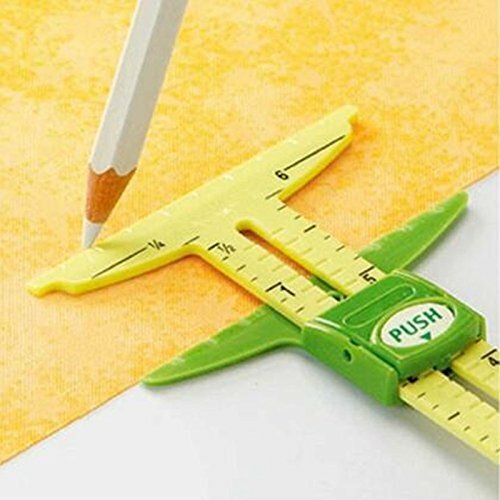 Plus, the ruler is designed for either right- or left-handed use. 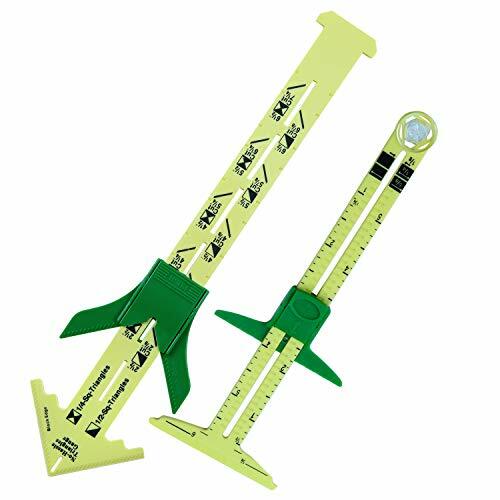 You won't find another ruler with OLFA's patented compass pivot-point angles. Use the ruler to work with fabrics, paper or other materials. Made of stainless steel, smooth surface, the end is not pointed, won't hurt you when you're using it, not easy to deform and fade, sturdy enough to last for many years, a practical tool for your sewing work. 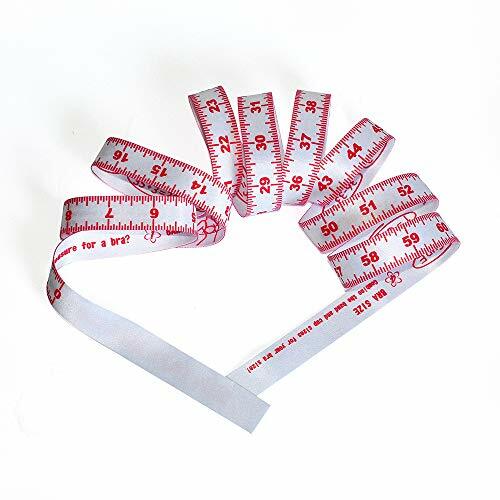 Easy to open, no worry about breaking when use it, hold fabric fold tightly, keep them in right place in sewing project, clear printed ruler, which has 3 inches measurement, help you to keep a straight line, makes hemming clothes easier. A nice tool to be applied to sew or hem clothes, especially helpful for beginners in sewing project, made hemming easy and neat, save your time and effort. Stop Sewing Crooked Hems; Get That Perfect, Professionally Tailored Finish. Sewing hems is a basic sewing project, but measuring, marking and pinning them so they'll actually come out even is a tough task, even for experienced seamstresses and tailors. 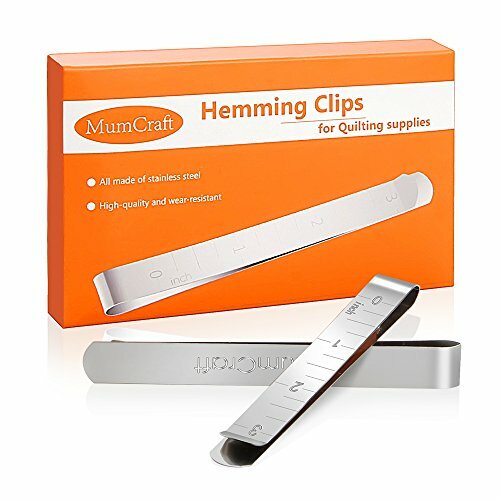 These hemming clips are the stress-free solution. Stainless steel clips glide onto fabric and hold it in place as you sew. Marked with measurements for easy, one-step use. 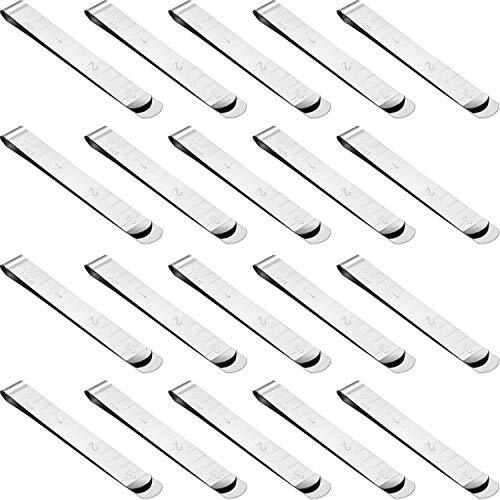 Set of 12 clips. BAND MEASUREMENT: Run a tape measure all the way around your body just underneath your breasts and take a measurement in inches. Make sure the tape measure is horizontal and fairly snug. BUST MEASUREMENT: Take a "gentle" measurement across the fullest part of the bust. This is your bust measurement. BRA SIZE: Combine the band and cup size for your bra size! Applications: Keep track of bra growth and inches lost for waist, hips, bust, arms and more. Measure clothes length and baby growth. Any questions please don't hesitate to contact us, we will reply you as soon as possible. Material: Cloth, soft and comfortable to measuring our body and chest measurement. Measuring Range: 0 - 62 inch ( cup size include - A B C D E). Very easy to use and understand. It is not only can measure chest circumference, but also can measure everything if you want. We can track our cup size grow, very helpful for ordering bras online in the correct size! They can be used to measure body, measure clothes length, waist circumference or head circumference of growing baby. 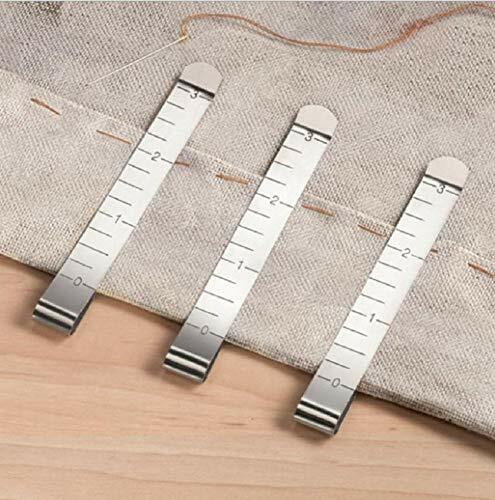 5 in 1 Sewing Measuring Tools: T-Gauge, hem gauge, seam allowance, buttonhole spacer and circle compass. which is very suitable for use as a marker on fabric. 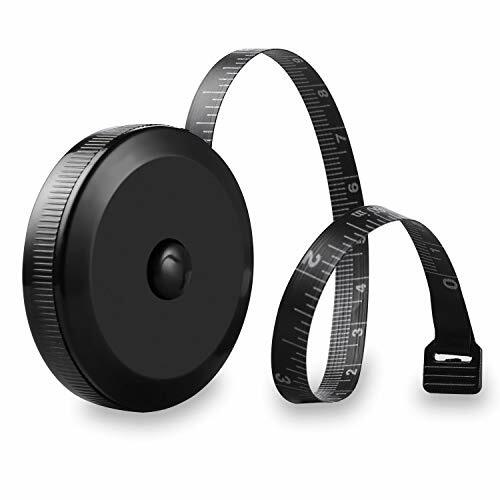 Circle compass: Fix the end of the Sewing Measuring Tools button, put a pen on the hole of the cursor, you can draw the arc. marked according to the standard width of the seam width 1/8", 1/4", 5/8". Buttonhole spacer: Measure the spacing and position between the buttons according to the cursor on the sewing ruler. Hem gauge: Fold your fabric and set the gauge to the length you want, pin it and go along. Smooth and smooth without burrs, suitable for diamond painting 2.8 magic radius drill, namely 50 diamonds, 141mm. Good Quality: made of stainless steel material with precise measurement, measures hems professionally up to 3 inches wide without any crook. Applications: ideal for hemming clothing, curtains, skirt, pants or shorts and more. Suitable for machine work and hand sewing. Material: made of high quality stainless steel with smooth polishing, anti-rust, anti-corrosion, oil-proof. Good quality sewing clips set. Product Measurement: total length: 4inch/11.5cm. Measures hems professionally up to 3 inches wide without any crook. Easy to Use: light enough to be flexible and tough, way better than pinning stuff for general purpose sewing, no more broken needles, springs are smooth on fingers for frequent use. 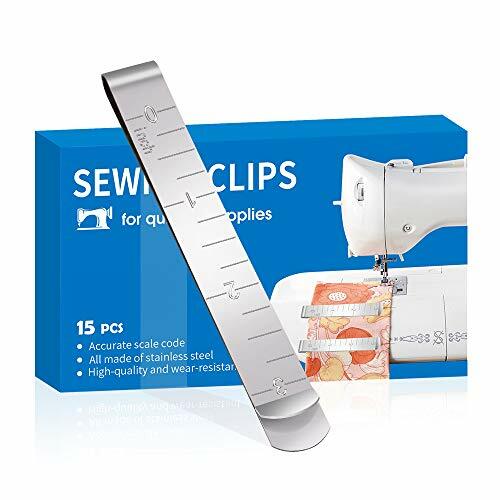 Applications: The Sewing Clips are great replacement for traditional jabbing sewing pin, works great for hemming clothing, curtains skirt, pants or shorts and more, great sewing tool for machine work and hand sewing. 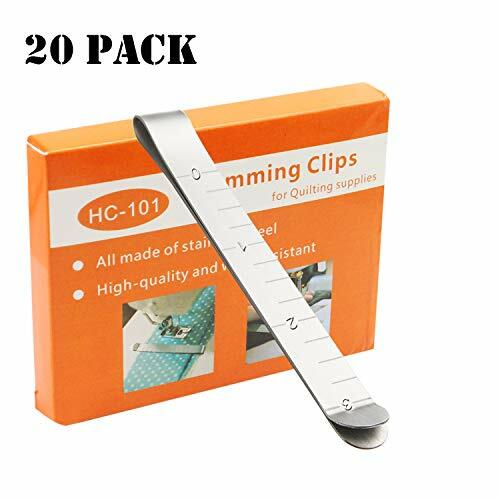 Package includes 20 pieces stainless steel hemming clips with the markings engraved on the hem ruler, tough marking for long time of use. Enough quantity for the sewing needs. Use this handy tool for marking button holes; seam allowance gauge; hem gauge; circle compass; T gauge and that is only sewing. Try this handy tool for scrapbooking; card making; paper crafts; and much more. Adjustable from 0 to 5-inch in 1/8-inch increments. Constructed of plastic. Imported. No measuring required. 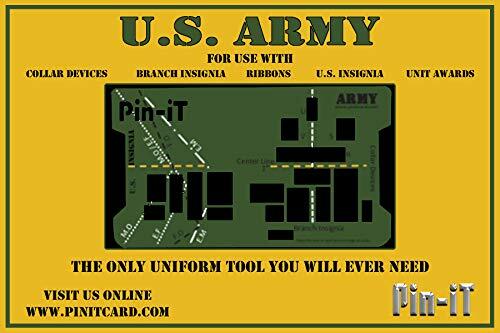 The Army Pin-iT Card does all the work for you. Just place it and Pin-iT! No matter if you need to rig your uniform with medals or ribbons, the Army Pin-iT Card will help you look professional. Perfectly place your military ribbons and medals on your uniform. For use with Army Medals, Army Ribbons, ArmyUniforms. Army Uniform Tool that helps place Ribbons, Medals,U.S. Insignias, Branch Insignias on a uniform. Stop using the Ruler!! Use The ARMY Pin-iT Card. Works with Army Branch Insignia,, Army U.S. Insignia, Army Ribbons, Army Medals, Army Rank Insignia, and More.